Whether you choose a specially offered Aruba family vacation package or not, you and your kids are going to have the most enjoyable Aruba family vacation ever! Scroll down to read about Aruba's "ONE COOL FAMILY VACATION" promotion. Your family will love the clean beautiful white sandy beaches and the gorgeous blue green ocean. The resort pools are spectacular with their waterfalls, fountains and slides. The kids will get a kick out of seeing the beautifully colored exotic birds and the harmless meandering iguanas at the resorts. On your Aruba family vacation there are numerous beach activities and water sports to enjoy. Some families enjoying spending the day on Baby Beach with the little ones. Why not take the whole family fishing in Aruba. The kids will really have a fun time and so will you. You might want to take a break from the beach and take an exciting sightseeing off road Jeep adventure. On your Aruba family vacation take the kids to the Ostrich Farm, Donkey Sanctuary, or The Butterfly Farm one day after breakfast. There are museums, weekly festivals, and unique malls to visit. The Paseo Herencia Mall has colorful liquid fireworks to enjoy and the new Palm Beach Plaza Mall has a choo-choo train for kids, a rock climbing wall, movie theater and more. You and your children are sure to enjoy the unique experience of the Atlantis Submarine Expedition. Don't forget to visit the exciting caves found in Arikok National Park. Be really adventurous and take a helicopter tour of the island. An Aruba family vacation is both for you and your kids to enjoy. Each resort has their own program to keep your kids busy and active. Some resorts have their own camps for kids with supervision from trained camp counselors. Your children will be building sandcastles, swimming, creating island arts & crafts, playing games, and much more. While on your Aruba family vacation, whether you chose to keep the family together each day or have the kids join the resort’s camp program doesn’t really matter. 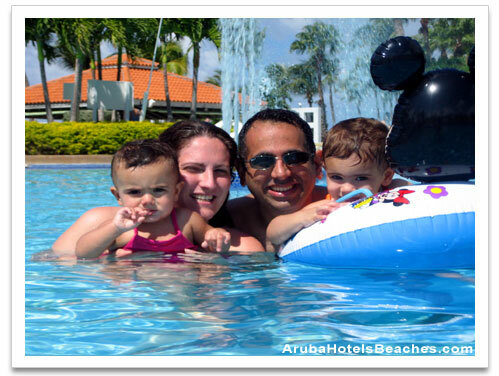 Your family will still have the best Aruba family vacation ever on the island of Aruba! The free “ONE COOL FAMILY VACATION” promotion is a special offer for families with kids 12 years old & under. (June – September) This Aruba family vacation promotion offers discounts throughout the island for attractions, meals and shopping as well as a "kids-eat-free" feature at many participating resorts. You will be issued a One Cool Vacation card at check-in. Some restrictions apply. When making your reservations for your Aruba family vacation be sure to ask for the “ONE COOL FAMILY VACATION” package. *DIVI ARUBA FAMILY VACATION PACKAGE is for families with kids 12 years old and under, maximum 2 children per room. Divi Aruba All Inclusive: Kids 12 and under are free All Inclusive when sharing a room with parents, Free Kids Club for kids 5-12 years old, free gift. For kids 12 to 17 it will cost parents $75 per child, per night and possible additional fees. *Hyatt Regency no longer offers a family gift. *Check with your resort for any change in prices. Camp Hyatt Watapana is a supervised activities program for children 3-12 years of age, available daily at an additional charge. Children must be potty-trained and free of diapers. Suggested attire includes play clothes, swimsuit, sneakers and, of course, sun block. Advanced reservations are required 24 hours in advance. Your kids have so many activities to choose from and probably won’t even miss you! Whether they attend a day or evening session, the counselors will keep them entertained from the minute they arrive. Activities take place indoors and outdoors. Movies & Popcorn, Baking Cookies, Arts & Crafts, Coloring Contest, Pool & Slide Fun, Board Games, Beach Fun, Sand Castle Building Fun, Musical Chairs, T-Shirt Painting, Tennis Clinic, Video Games, Ring Tossing, Nature Walks, Papiamento Lessons, Story Hour Aruba’s History, Finger Painting, Balloon Contest, Ping Pong, Butterfly Farm visits, Bowling. Check at the desk for information about the Shoco Land Kids Club. The Bon Bini Kids Program is supervised for children five to 12 years olds for either half-day or full-day sessions ($35.00). The clubhouse has an undersea theme. Toys, games, video games, basketball, arts and crafts and a reading corner. Kid Spree Vacation Club is a free, supervised, kids club program from 9:00 am to 5:00 pm daily, for ages 4-11. Different indoor and outdoor activities are planned daily. Kids enrolled in the Kid Spree program are split into four age groups so that they may enjoy age appropriate activities. Beach tennis, face & T-shirt painting, movies, excursions, board games, play garden, sand castle building and lots more! There is a full, indoor play area and even an arcade. Kid Spree staff and hotel babysitters are required to carry CPR and first aid certification. For younger children or parents who want individualized care babysitting services can be arranged with concierge 24 hours in advance. The fee is $8/hr (and after midnight the rate increases to $12). ages 5 - 12 with plenty of entertaining activities. Papiamento lessons, t-shirt and face painting, pool and beach games, scavenger hunt, snorkel and tennis clinics, basketball, movies, soccer tournament, bingo, arts and crafts, snacks and more. Patamingo Kids Club is open year-round for 5 to 12 year olds, and offers day and evening sessions with fun activities. Baby sitting services are also available. Please check with each hotel for current prices. On the island of Aruba you will find many family friendly restaurants.